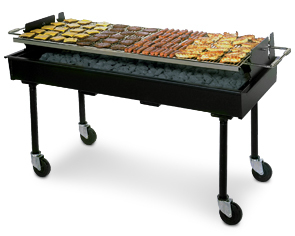 Model PG-2436-I | Firebox 24" x 36"
Model PG-2460-I | Firebox 24" x 60"
The PORTA-GRILL® I is big enough and rugged enough to feed large gatherings, yet light enough to be transported without a trailer. It glides on 5" casters for short trips; removable legs for long trips. Massive 24" x 60" (10 sq. ft.) or 24" x 36" (6 sq. ft.) sanitary nickel-plated cooking grate is made from 1/4" and 1/2" round steel bars . It easily adjusts to four different cooking heights with "Cool-Spring" safety grips. 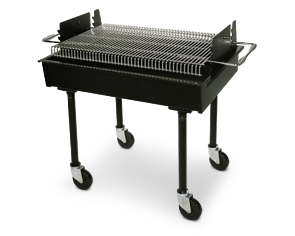 Patented flip-back grill feature allows for easy charcoal servicing and clean out. The firebox is fabricated from heavy-duty 1/10" thick (12 ga.) steel with 3/16" thick by 4-1/4" wide steel channels welded to the underside for reinforcement. Legs are made from 1-5/8" O.D. 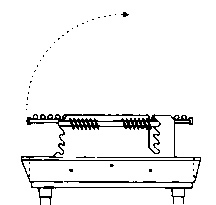 structural pipe with one end threaded for quick and easy fastening to the firebox. Entire unit is coated with a non-toxic, heat-resistant, flat black enamel finish. Speed up cooking time and conserve fuel by using a Bread-Box Hood with built-in thermometer or a New PORTA-Shield (both sold separately). ►Need a PORTA-GRILL® I Fast?